I recently gave a talk at UW-Madison. The presentation–part of WARF’s Entrepreneurons Series–was about entrepreneurship generally, and more specifically, about what it’s like to think up, launch and scale a start up. It’s something I’ve done four times, and I really enjoy drawing lessons from the success and failure I’ve had along the way. Start-ups are hard. As founders, we need all of the support and help we can get. I hope some of the personal lessons I highlight in this talk will help those of you that are in the start-up maze right now. And I hope my experience helps encourage more of you to make the leap. In my last post announcing my EIR role at American Family Ventures, I mentioned how much I value working shoulder to shoulder with smart people. Today, I want to highlight another method to surround yourself with brilliant people that can teach you, inspire you and drive you, even if you don’t have the opportunity to work directly with these experts in your day job. And it’s (mostly) free. What I’ve found is that it’s pretty easy to assemble your own customized panel of experts, thought-leaders and super smart people in almost any field. And, once assembled, this panel of experts will supply you with a daily dose of wisdom, no strings attached. Let me repeat: A continuous push of thought provoking, inspiring, and insightful content is waiting out there for you—it’s pretty incredible when you think about. And the fact that most of it is free means that you’re an idiot if you don’t take advantage of this great gift from the Interwebs. By way of example, here’s a small sampling of the sources that I’ve set up to push me information. You’ll note that most of this is related to technology, entrepreneurship and business innovation, but you can find similar experts in almost any field of interest (say Meditation, or Sailing, for example). Curated Emails & Lists. It amazes me how many people and organizations will now hand pick the best information out there on any subject for free. Here is my cherished group of curators. Jason Hirschhorn’s @TechREDEF. REDEF curates daily mixes of information around a number of themes. The Tech mix (tech + innovation + culture) is simply outstanding. I receive a daily email newsletter of these mixes and they never disappoint. Mattermark Daily. A fantastic daily email, “The Mattermark Daily is a hand-curated newsletter compiled daily to bring you first-person accounts of entrepreneurship, investment and insights from the startup ecosystem.” I especially love Mattermark’s selection of insights from operators (e.g., those in the trenches starting companies). StrictlyVC. The Silicon Valley editor of TechCrunch produces this daily curated email that tracks recent company fundings and other important news in the Venture Capital space. She calls herself “your very own venture capital concierge.” I agree. Jitha So it Goes. A weekly newsletter for start-ups, delivered each Saturday morning, it makes for great weekend reading. TechCrunch Crunch Daily. The grand-daddy of Technology and start-up news. I like the quick email summary of their most important posts of the day which keep me in the loop with minimum effort. Vox Sentences. This daily email does a wonderful job of describing the top three to five big news items of the day in simple, clear language with links to more in-depth reporting. I read it each night before bed and it feels like my librarian friend is telling me everything important that happened that day. 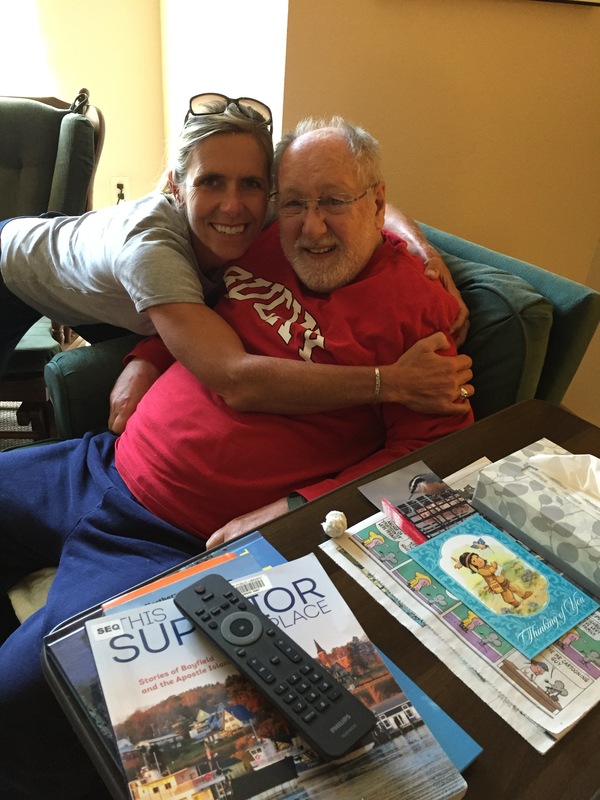 Twitter—By Way of Nuzzel. Like many, I stopped visiting Twitter on a daily basis because it can be overwhelming and time consuming. But Twitter remains THE source for timely news. Thankfully, there is now a wickedly brilliant and simple service called Nuzzel that enables you to get the best of Twitter in a daily email. Trust me, you need to sign up and use this service (even if you haven’t invested in following the right people—just pick the Nuzzel stream of someone with similar interests). I can’t believe Twitter hasn’t either copied this service or purchased it yet. I get a daily email of my Nuzzel feed as well as the feeds from several other people that have similar interests. You can read the simple concept behind Nuzzel here. Podcasts. Oh how I love you Mr. Podcast. You enable me to fill the dead parts of my day, commuting, mowing the lawn, etc., with the voices of brilliant people. And you give me a break from the screen, which is an extra bonus. It appears I’m not the only one that loves me some Podcast (see here and here). a16z. Produced by VC firm Andreessen Horowitz, these podcasts are short and cover some of the leading topics and trends that are top of mind in Silicon Valley, the epicenter of my profession. The Tim Ferriss Show. Tim Ferriss does deep dive/long interviews of elite performers in fields as diverse as music, government, start-up investing and big wave surfing. I sometimes struggle with the “dude factor,” but Tim is a great interviewer and many of these podcasts genuinely inspire me, uncover new insights, and identify people that I now follow. Common Sense with Dan Carlin. So much of being an entrepreneur is being contrarian. Dan Carlin is brilliantly contrarian in his take on current events, politics and society. The Writers Almanac. I wake up my brain every day with this five minute reading by Garrison Keillor. Exponent. I’ll say more about Ben Thompson below, but this is his weekly podcast with friend James Allworth. The podcast is a fantastic way to tap into Ben’s thought stream on technology and corporate strategy. I love it Ben, but please stop saying “fundamental” so much. Ben Thompson-Stratechery.com. Ben Thompson is a great example of the theme of this entire post, so I’m giving him an entire category. His site, Stratechery.com, is an embarrassment of riches for business strategy, innovation and technology. In addition to the Exponent podcast, he offers a paid Daily Update email and associated member forum (of which I subscribe, the only thing in this entire list that I pay $ to receive), and he also publishes a free weekly article. Here is Ben, at his finest, describing the Uber opportunity and developing a framework for disruptive technology. I can’t believe this information is free. Communities. In addition to Ben Thompson’s member forum, I’ll highly two other communities in my field of entrepreneurship—ProductHunt and Angelist. ProductHunt is an amazing community of entrepreneurs and product makers that debate and discuss almost every newly launched technology start-up. The community provides me with insight, competitive intelligence and inspiration on a daily basis. One of my favorite features is a set of curated startup lists that any Product Hunt member can create. For example, I’m interested right now in the Invisible Web, and sure enough, ProductHunt founder Ryan Hoover keeps his own running list of Invisible Web start-ups right here. Thanks Ryan! AngelList has essentially democratized the start-up funding process. It gives any start-up founder unprecedented access to investors, and highlights the best and most interesting start-ups, leaving you feeling very plugged in regardless of your geography. One of my favorite things is to check the Trending Startups, which AngelList is nice enough to push to me in a weekly email. Feld Thoughts, by Brad Feld. Steve Blank, by-you guessed it-Steve Blank. Online Courses. This post is getting too long, but I can’t neglect to mention the fact that you can use services like Coursera and others to sign up for university and graduate level courses, as well as find folks that are posting their summary of courses online (like this one I’m following from Chris McCann who is posting his notes on Reid Hoffman’s new Stanford Business School course “Technology-enabled Blitzscaling”). So there’s my highlighted list**. If you’ve spent the time to create something similar (or better) in your field of interest, kudos to you. I hope you agree with me that it is well worth the effort. I don’t have time. I suspect many of you are thinking that you don’t have time to assemble and digest information like this. For many of you, I’m calling B.S. The average American watches 5 hours of T.V. everyday. Add in passive screen time for things like Facebook and I’ll bet that hourly total goes up a lot. Could you take 10% or 20% of your T.V. and leisure screen time and devote it to building your expert panel? Could you organize your day differently, say to get up 20 minutes early each day for your experts? In my own life, I discovered that I was listening to entirely too much sports talk radio. It was like bubble gum for my brain. Once identified, I was shocked at how much time I spent listening to debates about who is going to start, get a contract extension or win the next game. I quit it cold turkey and substituted all of that time with the podcast material I highlight above. It was a fantastic trade off. Do you have a bubble gum for the brain habit that you could substitute? I don’t know where to start. In addition to asking friends and colleagues for recommendations and searching for a few podcasts in your interest area (see the Podcast articles I link to above), I’d start with Nuzzel. Pick anyone that shares similar interests with you and that uses Twitter regularly and follow their Nuzzel feed (for example, here is super investor Chris Sacca’s feed). It will lead you on a journey of personal development that you won’t regret. There are lots of successful people out there, ready to push you. What are you waiting for? *Still in school? 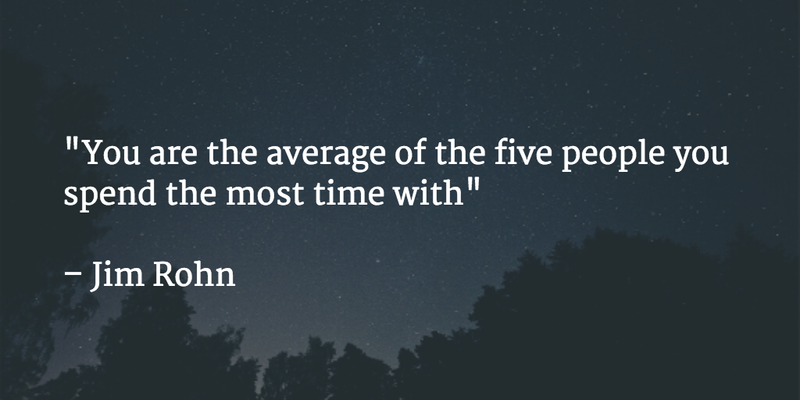 Start building your daily push of experts now and you’ll have a HUGE advantage over your peers. **If you’ve got a favorite expert or source that I haven’t mentioned, please leave them in the comments below as inspiration. I just finished a year off. As I mentioned here (Why I’m Taking a Sabbatical), I set out to have an adventure with my family and to better answer the question “what am I on this earth to do?” It was an incredible opportunity to step out of regular life and take a long, hard look at myself—an out of body experience. Sure it was scary to be on the sidelines and my bank account hated it, but it was one of the most valuable things I’ve ever done. There are obvious reasons it was awesome, like precious, 100% time with my family and teaching my son. But I also learned something very valuable about myself. I learned that I love to create things—it’s what makes me come alive. This is sort of a hard thing to realize because my creative outlets are limited by my lack of skills. I can’t paint or draw or sculpt. I can’t sing or play an instrument or compose a symphony. I can’t dance (at least not well). What does that leave? Thankfully, it leaves something I’ve already done . . .
To me, there is nothing quite as amazing as taking an idea that develop in your mind (often with people smarter than you) and help to launch that idea and see it take on a life of its own. To see it solve a problem and make a difference in peoples’ lives. Ask any grizzled entrepreneur and they will likely agree that the experience is intoxicating and will have you coming back time and time again for more. I want to continue working in the world of ideas. That’s why I’m excited to announce that I just started a new role as an “Entrepreneur in Residence” at American Family Ventures. It’s a great opportunity for me to support the innovation initiatives that American Family has underway, at the same time that I explore solutions to the problems that matter to me. This is only the second time in my professional life that I’ve worked* for a company that I didn’t help start, but the decision was a no-brainer for me for several reasons. The innovation team at American Family has some serious horsepower. I love working with people that are smarter than me. There is no better way to become better at what you do. Entrepreneurship is hot right now, and almost every Fortune 500 company is talking about innovation. But a lot of it is just talk while the C-Suite continues to focus myopically on making its next quarterly number. American Family’s innovation push, in contrast, is coming from the CEO and leadership with a real mandate. They are taking the long view. And backing it up with real actions. Case in point—a company using innovation for their public window dressing wouldn’t quietly (and massively) increase the $’s allocated to their Venture Fund. But guess who did just that? I’ve sat across the table from venture investors and big company biz dev and M&A folks for 15 years. I now get to sit on their side of the table—get an inside view of how they make decisions, what keeps them up at night, better understand their incentives and what their world is really like. Empathy is a hidden super power of really good entrepreneurs (a fact I’ve written about before) and this experience is going to make me a better/stronger/faster entrepreneur. I’ve done a lot of reading and thinking during my year off. I’m excited to jump back in and start making things happen again. **This is not a guarantee that I’m going to start something in the insurance space or even launch another stand alone start-up from scratch, but many of the themes being addressed in this space (consumer data, customer relationships, social risk, Aggregation theory) fascinate me. I’ll admit it. As an entrepreneur working in Wisconsin, I’m jealous of Silicon Valley. A few weeks ago, a social planning app called Free (Ffrree.com) launched. It wasn’t much different than the dozens of other mobile apps that have tried (and failed) to solve the tricky problem of social planning. There is a high body count in this space—Klamr, Hotspot, Klutch, WeShould, WeOtta, Inviteful, Flock, WePopp—the list goes on and on. And I should know; my previous start-up Nextt is in this list of casualties. Ffrree, in my humble opinion, hasn’t really done anything significantly better than these past start-ups. Not yet anyway. Sure, the UI is very clean and easy to use, but do people really want to broadcast that they have nothing to do, e.g., they are “flexible?” And the service is only available on the iPhone. What about the +50% of my friends that have Android devices and are left out of the main features? And yet, despite these drawbacks, Ffrree launched with some fanfare, including a glowingly positive TechCrunch post and a coveted spot in Apple’s Featured App section. This is a HUGE advantage. As a start-up, it isn’t enough to build a great product. You need distribution for that product or you will fail. Even if your product is awesome. As Peter Thiel points out in Zero to One, relying on the Field of Dreams if you build it they will come strategy isn’t going to work. I talk to a lot of founders, and this is a very common mistake that I see over and over again. Focus solely on building a great product and neglect how you are going to get customers at your peril. My first reaction to the Ffrree launch was to say WTF? It feels like these guys have an unfair advantage just because they are in Silicon Valley. Inherent distribution baked into the product by means of geography. But this is a stupid reaction on a few levels. First, I hope Ffrree is wildly successful, as I really believe in the mission to make social software connect us more in the real world away from our screens. Good luck Ffrree. And more importantly, you aren’t going to learn anything with sour grapes. So I’m focusing on what I can learn from Ffrree, and Silicon Valley in general. Here are my takeaways . . . There was a video that made the rounds a couple of months ago that showed the incredible power of context and packaging. In the video, a mass-produced IKEA poster was placed in a fancy Dutch art gallery. And as you might expect, lots of folks gushed over its brilliance. A crappy IKEA poster, worth millions when placed in an art gallery. Tynan has a great post on this subject here in which he talks about how cheap wine in fancy bottles got the same glowing reaction and how a violin virtuoso who draws tears in concert halls received almost zero attention when he posed as a street musician. I think this same bias is at play in the case of Ffrree. Compare the media reaction to Ffrree with the negative coverage that Microsoft received when it launched its own social planning app called Tossup around the same time. Did the fact that bumbling behemoth Microsoft was behind Tossup and a Silicon Valley stud cofounded Ffrree matter? Of course it did. Here is the simple truth: people are busy and we all use shortcuts to navigate our jobs and our lives. We apply rules to save time. And if you are an entrepreneur, one of the most important rules is this—no one is going to pay attention to you unless you can quickly validate your start-up. Potential investors, co-founders, employees, customers and advisors are looking for clues about whether your start-up is worth their time. Reporters too. The founders have really solid backgrounds, including leadership roles at high-powered consumer technology start-ups. Been there done that. They have a really high profile roster of investors, including Google Ventures, First Round and Chris Sacca’s Lowercase Capital. They probably got warm introductions from friends that are friends with the folks writing at TechCrunch and gate keeping at Apple. Stanford or YC alums likely. People vouched for them. What Can We Do Outside of the Valley? So what can entrepreneurs that work outside of the Valley do? Especially those of us in smaller market cities like my city of Madison, Wisconsin, that don’t enjoy the advantages of Ffrree. Super investor Chris Sacca was interviewed on Tim Ferriss’s podcast recently. The entire interview if really great, but one of the most brilliant things that Chris highlighted in his discussion is how empathy is a secret super power of great entrepreneurs. I couldn’t agree more. Successful entrepreneurs (and big company leaders, sales people, marketers, religious leaders, the list goes on and on) are really good at figuring out the worldview of the people they want to influence. They are able to put themselves into the shoes of the customer, the investor, the employee, and any other high profile target they need to capture. What makes her job easier? What is she afraid might happen? What does he strive to be? What key point will motivate this person? Let’s apply this concept to the goal of getting launch coverage in TechCrunch. If you can’t use the validation playbook that worked for Ffrree, what else can you figure out about that TC reporter? How can you make their job easier? How can you add value? What validation can you present that fits into the short cuts they apply and makes covering you low risk/high reward for them? Here’s one simple idea: Maybe they are concerned about Silicon Valley bias. Maybe they realize that they write mostly about stuff in their backyard. You could pitch the opportunity to write about this concept at the same time that they mention you. It’s a way to turn your weakness (not in the Valley) into a strength (different=worthy of attention). I’ve tried all kinds of pitches like this, and they always start with empathy for the target. Sometimes they work and sometimes they don’t. The important thing is to take your best shot with that specific target’s world view in mind—a blanket spam press release to everyone under the sun is a complete waste of time. There are many more ways in which you should practice empathy–in particular by applying it to your potential customers—and I plan to return to this subject in a future post. But the key takeaway here is that those of us outside the Valley have to be masters of empathy to get people to pay attention to us. I know this view is anathema in today’s entrepreneurial community, but I think the Lean Start-up method—treating your start up like an experiment through which you “fail your way” to success through a series of rapid fire product tests—is being overused and misused by lots of entrepreneurs. A start up is more like that IKEA work of art than it is an easy A/B test. Presentation matters. I had a start-up pitch me last week on an advisor role. 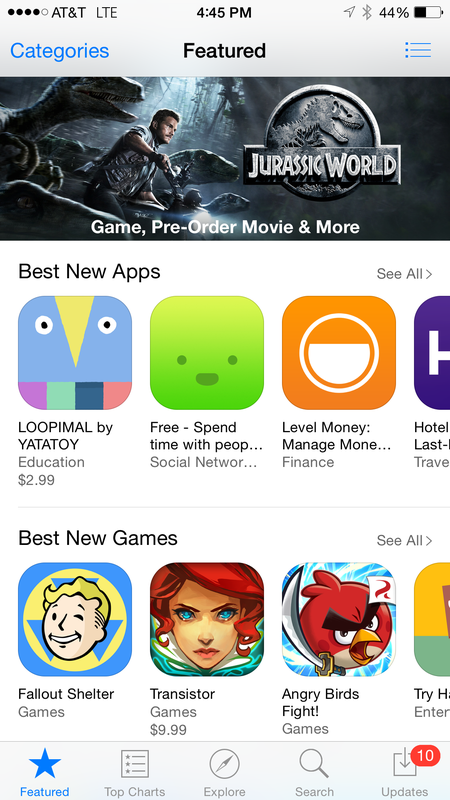 The first thing I did was check out their website and the images of the app in the App Store. And amazingly, I found numerous spelling errors in both. I applied my own short cut—these guys don’t know what they are doing. They are sloppy and overwhelmed and if they can’t do this simple thing correctly, it is highly likely that their actual product deliverable is equally shaky. I’m out. I’m sure the founder in this case was trying to apply the Lean Start-up mantra—move fast with a very basic version of your product so you can get actually customer feedback into your organization as quickly as possible. Speed trumps presentation and packaging. And while I wholeheartedly agree with the overall goal of getting market feedback ASAP, you need to recognize that you are playing with fire here. How many customers looked at the huge spelling error on the first screen of the app store image and applied the same short cut that I used? Is this founder really getting true market feedback with his sloppy product presentation? I doubt it. Using Lean Start-Up takes a high degree of discipline and proper sequencing to truly separate signal from noise. You can’t just throw stuff around and expect to see what sticks. Maybe folks with Silicon Valley connections and pedigrees can get by with sloppy v.1 product tests because they carry the Silicon Valley brand. But that playbook doesn’t work well for those of us scrapping and clawing our way past the gatekeepers and smaller pools of early adopters outside of the Valley. Presentation and packaging matter. Perception matters. Brad Feld has done lots of great work on how to make a start-up community take off anywhere. He’s literally written the book on it and backed up his ideas by applying them in his town of Boulder, Colorado. One of the most important pieces of this advice—start up communities need to stick together and support each other. Silicon Valley is great at this. They have a huge, hungry pool of early adopters ready to try new unproven things—a.k.a. eating their own dog food. Uber is a fantastic example—they launched and cut their teeth providing fancy black SUV rides to the San Fran early adopter crowd. Would folks in other start-up communities have hopped into the back of a stranger’s car with some unknown service launching in their community? Probably not. We need to have this same early adopter spirit in our own start-up communities. I’ve been a huge offender of this rule; head down focusing on just my own work. I’m vowing here to change. I’m going to try to lend what support I can to organizations like Capital Entrepreneurs, MadisonStartups.com, the newly formed Starting Block Madison, The Water Council, Gener8tor, and other local efforts to publicize and grow start-ups in my region. One easy thing that anyone can do: I’m going to make an effort to be an early adopter for start-ups in my region that count me in in their target market. And lastly, I’m going to encourage those of us in entrepreneurial communities outside of the Silicon Valley to think broadly about how they define their community. Bigger is better in my opinion. In my specific example, Madison and Milwaukee and the Fox Valley and Whitewater need each other to put together Brad Feld’s four required elements of a start-up community. And while we are at it, why are we stopping at our borders? Minneapolis/St. Paul and Chicago are close neighbors. What can we do to here in Wisconsin to pull in and leverage the resources they enjoy as larger markets? What can they gain from our support? Labels matter here. Maybe we need a new label that captures and coordinates the entrepreneurship happening across our region. Minnesota recently came up with a really clever campaign to separate themselves from the stodgy Midwest label and recast themselves as “The North.” Is there a label that can make our entrepreneurial community bigger, stronger, better? Bottom line—it is possible to build a very successful start-up outside the Valley. But we need to realize that we don’t enjoy all of the built in advantages that their geography affords them. We can’t succeed by simply copying the market leader. We have to bring something different and unique to the table. We need a different playbook to succeed in our own neighborhood. *Attention at launch is great—but it has to also be backed up with a great product and sustainable business model to ultimately succeed, even in the Valley. The anonymous messaging app Secret (https://www.secret.ly/) is a recent and classic example. My wife, son and I just returned from a 5-month trip. 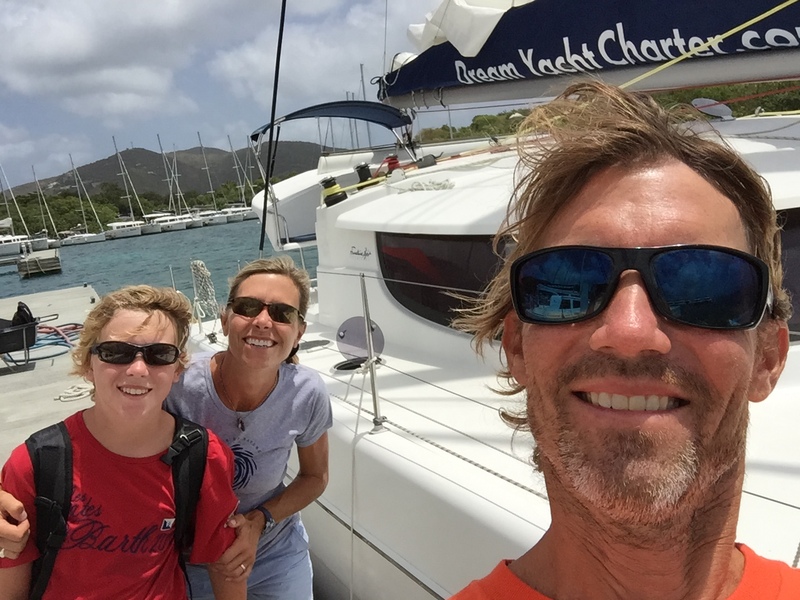 We spent most of this time sailing a boat from Grenada to the Virgin Islands. Just the three of us—it was an amazing, inspiring, awesomely fun adventure. 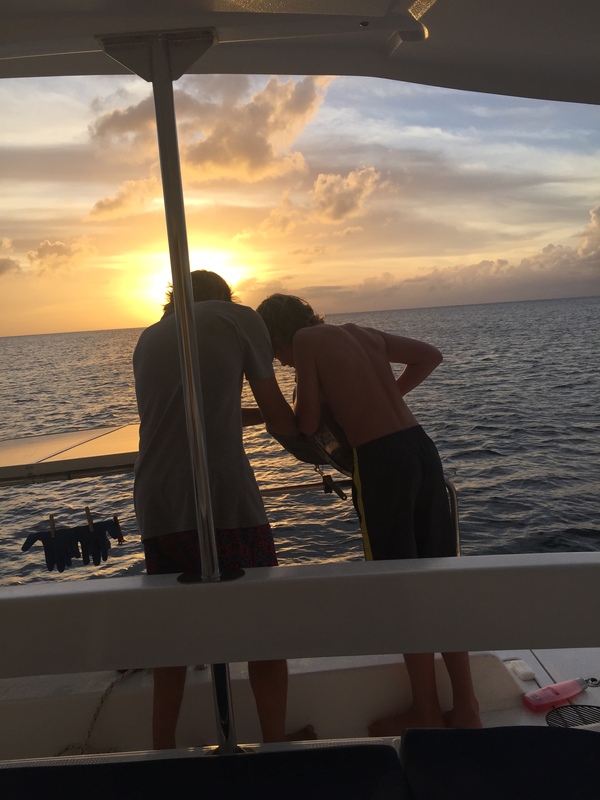 I had several goals for the trip, but now that it’s over, I think one of the best parts of the experience was homeschooling our son, who turned 13 on the trip. 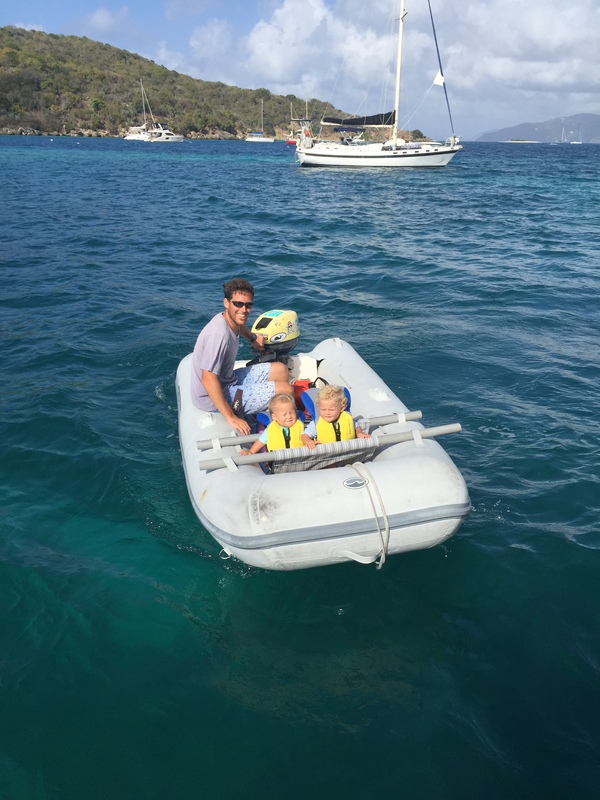 With two caveats*, I’m going to try to highlight some of the best parts of that experience, and ways in which any parent can try to achieve some of the same benefits we found without quitting a job or heading out on a sailboat. Put another way, here is a very big question that every parent should ask: What is the best way to educate my children to maximize the chance that they will be smart, creative, curious, happy adults that make a positive impact on the world? In other words, successful. I read a book recently called “How Children Succeed.” In the book, the author bifurcates the skills and capabilities that education teaches our kids into cognitive and non-cognitive groupings. Our current educational system stresses the cognitive. Math skills, reading comprehension—stuff that you can practice through repetition and that can be easily measured and tested. But what about the non-cognitive? Things like persistence, self-control, curiosity, grit, self-confidence and creativity. These are much harder to teach or measure in a standardized setting, but they are highly correlated to success in the real world. Some people call them character. I’m an entrepreneur. I’ve been able to make a great career, despite the fact that I didn’t go to school to study to be an entrepreneur or even learn about business (secret: my math skills weren’t good enough to get into business school). I learned most everything I know about my profession by jumping in and muddling through. And although my 20 years of traditional education taught me a great deal, I actually had to unlearn a couple of things from school that would have held me back from success. I wrote about these lessons here, but the short version follows. School taught me that my teachers and professors will tell me what I need to know—I could just sit back, memorize what they taught me and wait for their graded approval. School also taught me that in order to be successful, I needed to be good at everything. This meant that I spent the majority of my time devoted to subjects in which I lacked a natural talent. Successful people in the real world do NOT follow these two lessons. In fact, they do the exact opposite. If you want more evidence of how our current educational system is creating generalist followers, this talk by Sir Ken Robinson is worth watching. Thus, we looked at the opportunity to take Jimmy out of his 7th grade classroom for a semester as a challenge. How could we best compliment his ongoing public education? How could we develop those non-cognitive skills and provide him with the best opportunity for adult success? I’m not an expert in education and I don’t pretend to know all of the answers. But here are a few things that we experimented with that seemed to work. #1. We put Jimmy in charge of as much as possible. What do you want to learn? Pick a few things that really interest you. Jimmy picked fishing. He picked learning about sharks and the other creatures that live in the Ocean and on the islands of the Caribbean. He picked investing and the stock market. And we also encouraged him to ask questions about the world around him and we would help him figure out how to answer those questions. Hidden lesson: don’t wait for others to tell you what is important. Go out and do what interests you. Find out stuff that you have a “knack” for doing. And do more that stuff. #2. Curiosity meet the Internet. We have a box of old encyclopedias in the room above our garage. That’s where I was forced to go for answers when I was thirteen. Today, we have the Internet. Anything you want to learn, you can. Never in the history of the world has it been easier to follow your interests to become an expert in something. Throughout our trip, we researched questions that came up, like tides and weather and Communism and Darwin’s Theory of Evolution. Why does Apple make so much money? Why is the Ocean blue? Why do my ears pop underwater? Those are great questions Jimmy. Let’s figure them out. And we also tried to be proactive in certain subjects rather than just reactive to specific questions. We subscribed to podcasts. Jimmy learned the ukulele from YouTube videos. We signed up for online courses on physics and computer programming. And although we didn’t get around to doing ½ of the stuff I’d hoped to accomplish (like learning to program), I think all of this demonstrated to Jimmy that there is a big, amazing world out there that he can dive into anytime he wants. #3. Blurring the line between schoolwork and life. Before this trip, Jimmy’s life was organized into pretty tight segments. School time, homework time, and all that other time when he didn’t have to learn anything and was free to actually have fun. We turned this upside down on our trip. Sure, we had a few set school tasks to keep Jimmy up on his cognitive skills like math, reading comprehension and writing, but we kept scheduled school time to a minimum. Instead, we tried to weave learning into just a normal part of each day. A great example of this is something that we did for entertainment. Because we didn’t have T.V. or Internet often, I downloaded NPR’s Serial podcast on my phone for us to listen to at night after dinner. The podcast was about the trial and conviction of a teenage kid for the murder of his girlfriend and the lingering questions about his guilt or innocence. And although it entertained us as much as a good television series, it also taught Jimmy a ton about the rule of law, how our courts work, criminal law, debate, and truth and justice. But it never felt like school. This happened over and over as we simply explored the “real world” on our trip and Sarah and I talked about things the world has already taught us. #4. Experiment with Calculated Risk Taking. A lot of the things that I’ve achieved in life have been the result of calculated, thoughtful risk taking. I bet you can say the same. Yet why is it that in the U.S. we work so hard to completely take our kids out of managing any risk in their lives? Many of us would put our kid in a giant protective bubble if we could. I think it’s a big mistake. Kids are capable of much more than we sometimes give them credit. We saw this first hand during our time on the Island of Dominica. Dominican kids are treated like little adults. For example, many of these kids receive a machete before they turn 10. A big, sharp machete. Yet, we didn’t see a single kid missing a finger or hand or worse from this responsibility. They step up to the responsibility and they become very confident in the process. Jimmy took a lot of calculated risks on the trip. He learned to scuba dive. He checked our anchor by himself. He swam in deep water where he couldn’t even see the bottom. We bought him a machete. We made him “captain for the day” at the end of our trip and he was in charge of sailing a 41ft, thirty ton boat from point A to point B. And each time he used his own judgment to manage a risk effectively, he got more and more confident and better able to understand a good risk from a bad one. To be exceptional at something you must, by definition, be outside the norm. Yet, as social creatures, we feel a tremendous obligation to fit in. To go along. In most professions, just fitting in isn’t going to get you very far. And finding true happiness in life often involves having the guts to write your own script. Our trip was a bit crazy and atypical. It was really different. And not only did it show Jimmy how big the world is, I think it has also given him the permission and freedom to be different when he so chooses. To put another way, Jimmy now views being different as a positive part of his identity. I think this is a tremendous gift to give any teenager. I listened to a podcast interview of Chris Sacca recently. Chris isn’t exactly a household name, but he is one of the best early stage investors on the planet and he has over a billion self-made dollars to prove it. When asked what he viewed as the most undervalued skill in an entrepreneurs skill set, he didn’t hesitate with his answer—Empathy. I couldn’t agree more. It’s hard to make any change in the world without influencing other people. And it’s impossible to influence people unless you understand their worldview. What makes them tick. What they fear and love and hope for. That’s empathy. We didn’t explicitly set out to try to teach Jimmy empathy on our trip—it just sort of happened. Looking back it makes sense. We met people from all walks of life: All sorts of different ages, income levels, nationalities, ethnic backgrounds, and cultural backgrounds. We ate and drank with them, we worked with them, we hiked and explored with them, we played with them, and we tried to help when the opportunity presented itself. And Jimmy was like a sponge in each of these experiences, soaking up our differences, asking questions, trying to make sense of why all of us do what we do in life. My guess is that this part of our experience will be the most lasting and most impactful part of our road school experiment. I don’t want to paint too rosy of a picture here. Not everything we did worked. Hardly. The best example of this is probably my efforts to instill in Jimmy the value of deferred gratification (doesn’t it feel better to play on your phone after you get some quality work done?). During the trip, we worked with Jimmy to fill out a daily and weekly “sheet of integrity” that listed the things he wanted to accomplish. He did this every week and most days, and even experimented with the format of his lists. I hoped that this would result in an epiphany—it feels better to relax and goof off when I’ve done something worthwhile first. I had visions of Jimmy at home this summer, getting up and independently setting his priorities for the day. It hasn’t turned out that way. Left to his own devices, I’m pretty sure he would play video games and binge watch Netflix all day. Perhaps I had too high of expectations for a 13 year old. Perhaps I just need to give him the control to be a slacker for a week or two and miss accomplishing things. I’m not sure of the answer, but I wanted to point out that we don’t have one yet. All of this is a work in progress. Parents can be divided up many different ways, but here let’s divide them into two groups: those who continually work to become better at the job of parenting, and those who do not. My guess is that any parent reading this post falls into the former camp. And I hope that I’ve inspired you and perhaps given you some new things to try in your quest to give your kid the best chance of being a success. To that end, here are a few specific ideas. Go out and do something with your kid in the real world. Sign up for a volunteer experience. Road trip to a new town for the day. Visit a museum (yawn). Get outside of your day-to-day routine together. Doing this has two huge benefits: a) it shows your child that you care about them with your actions; and, b) it enables them to learn how you navigate and understand the world. You are their most direct and impactful teacher. And if you really want to make it count, do something atypical/weird that gives your kid permission to be unique. Don’t just go to a museum, have a contest to see who can find the ugliest work of art or the most obscure collection of things. Don’t just visit a small town, see if you can find the best piece of pie in your area. Don’t drive through a city. Walk it and see what you find. You get the picture. I just finished an inspiring book about death. That might sound impossible, but Peter Barton, the former CEO of Liberty Media pulled it off in “Not Fade Away: A Short Life Well Lived.” In the book, Peter approaches his impending death from cancer, and although this guy made gobs of money and rubbed shoulders with the rich and powerful, the thing that he seems most proud of is a series of field trips he designed and took with his kids that he called “Real World Outings.” They learned where things actually go when you flush the toilet. They learned about fast food. They visited an airport and studied luggage handling. Simple stuff, but it had a huge impact on him and his kids. Most of us have the ability to do these things. They don’t require millions of dollars or weeks of time. Go do something together. #2. Introduce your kid to risk. Resist the temptation to put your child in bubble wrap. Seriously. Financial risk, bodily risk, emotional risk. Let them quit something. Buy them a lottery ticket with their piggy bank money if that’s what they want. Do something physically challenging that takes courage. Give them something that they view as dangerous. Take the coffee challenge with them. And most importantly, even if they aren’t really in control and you are supervising the whole thing, let them feel like they are making the decision to take the risk. #3. Live in an intellectual household. We watched an amazing movie the other night called “The Lady in No. 6” about Alice Sommers, the oldest holocaust survivor in the world. It’s a short film and I’d highly recommend it for a number of reasons. But the one I’ll highlight here is what Alice said about her education. According to Alice, the most important form of education anyone can receive is to be brought up in an intellectual household. In fact, she credited it with setting the framework for her amazingly rich life. Just what does that mean, an intellectual household? To me, it means that as a parent you remain relentlessly curious about the world and that you share this curiousness and what you learn with your kids. Ironically, that is what I was trying to do while watching The Lady in No. 6 with my kids. Learn more about human nature and happiness. Here’s an easy way to get started. On your way home from work ask yourself, what did I learn today? And then share that with your kids at dinner. One thing I’m going to do this summer—paint one of our kitchen walls with whiteboard paint. And anytime I learn something new or cool, anytime I have a question or I’m confused, I’m going to whiteboard it. And I hope I can get the rest of my family to play along too. One example: “you are the average of the five people you spend the most time with.” You don’t need a literal whiteboard, but I think the image of your family whiteboard captures what it means to live in an intellectual household. Is your whiteboard empty or full? In closing, I’ll respond to what many of you are thinking—I don’t have the luxury of time to do all of this stuff. And some of you may not. But I’d challenge you to really think about how you spend the hours of each day. Here’s a personal example. If you are like me, you’ve probably invested a great deal in your kid’s athletic career. You’ve paid for camps. You’ve driven everywhere, even across state lines. You’ve sat on the sidelines. Hours and hours and hours of time. Don’t get me wrong, I love sports and I think they have a lot to teach kids. Athletics and exercise are a huge part of my life. But think about this time and whether you could take just a small portion of it to do some of the things you’ve come up with from this post. And then ask yourself which set of hours will have a bigger long-term impact. Bottom line, even if everything you try fails miserably, your child will be left with the most important belief of all—that you care deeply about them and tried your best. Anything else is really just extra. I apologize for doing a humblebrag about my own child. I couldn’t think of a way of talking about how great our travel school experience was without using specific examples of the benefits I’ve seen reflected in Jimmy. When I criticize our educational system, I’m talking about the system and not the teachers that participate in that system, may of which are wonderful, caring and smart people that make a difference in lots of lives. Just a few short weeks ago Sarah, Jimmy and I stepped off the boat that had been our short term home and began a 22 hour journey from Tortola, B.V.I., that included a ridiculously dangerous taxi ride, a ferry ride involving the rescue of a capsized sailboat, two long flights, and a 1AM drive from Milwaukee to our home in Waunakee, WI. We are back. Back to pets, unopened mail, and lawn mowing. Back to bills, budgets, expectations, responsibilities and goals. Back to friends and family. Back to feeling normal. But also feeling really abnormal, like we used to live here. But Missing This . . . . Yes, re-entry has had its ups and downs. Right now, I’m working hard to distill what I’ve learned from the experience and translate it into the next phase of my life’s work. Entrepreneurship, in many ways, is about freedom. Freedom from gatekeepers and bosses. Freedom to pursue something in which you are passionate. Freedom to pick and choose opportunities. Freedom to make yourself into something that you design. So I’m using my experience as an entrepreneur to help me address this strange freedom that comes from stepping outside of your regular life. This “must” question isn’t easy to answer. But as I consider it, I keep reminding myself that finding satisfaction and joy and meaning from life doesn’t come from lazy things like sitting around drinking beer all day—or from hard things like selling your soul to make more money so you can buy more material possessions (or sit around drinking more expensive beer all day). That stuff just doesn’t last. And I also remind myself that the “must” career question shouldn’t be a completely selfish one. It also has to work for my family and fit with the “must” responsibilities that I have as a husband and father. Exactly. Here’s hoping that we can all make an impact that matters. And that you are able to make the freedom to ask these questions too. 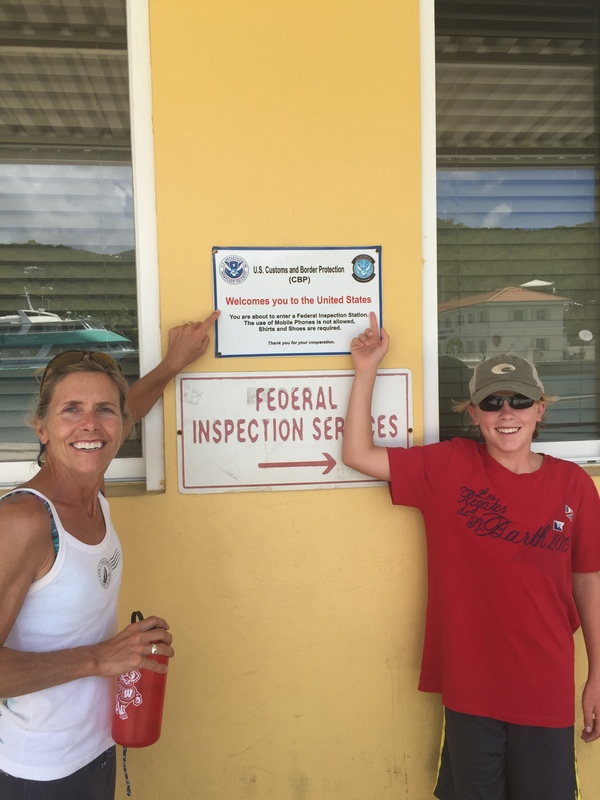 “Welcome back,” the Cruz Bay Customs Official said to me as I stepped up to clear into the United States on the island of St John. After the longest absence of our lives, we were back on U.S. soil. I have to confess that it felt good in a familiar sort of way. Like walking back into the family home after your first year of college. I don’t like everything that my country does, but I do love my country. 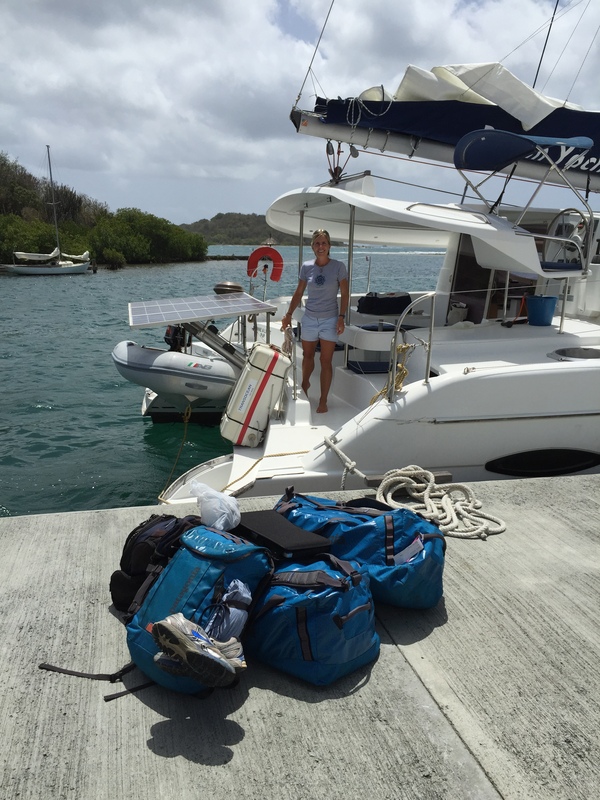 After clearing in, we made a short sail back to Maho Bay, on St. John’s beautiful north shore. I say “back” because we have vacationed here many times with family and friends. In fact, it is the first place that I dipped my toe into the Caribbean Sea. Tree frogs calling from the twilight hillside—the white sand of Maho beach reflected in the thick moonlight—the “goat path” up to the now shuttered Maho Bay Camps—the spot where my girls would “lay out” in a fit of adolescence bliss and burn their already peeling winter skin in the Caribbean sun. Places are like old songs, they bring memories pouring back. And this place was making us miss our girls, and our family and friends. 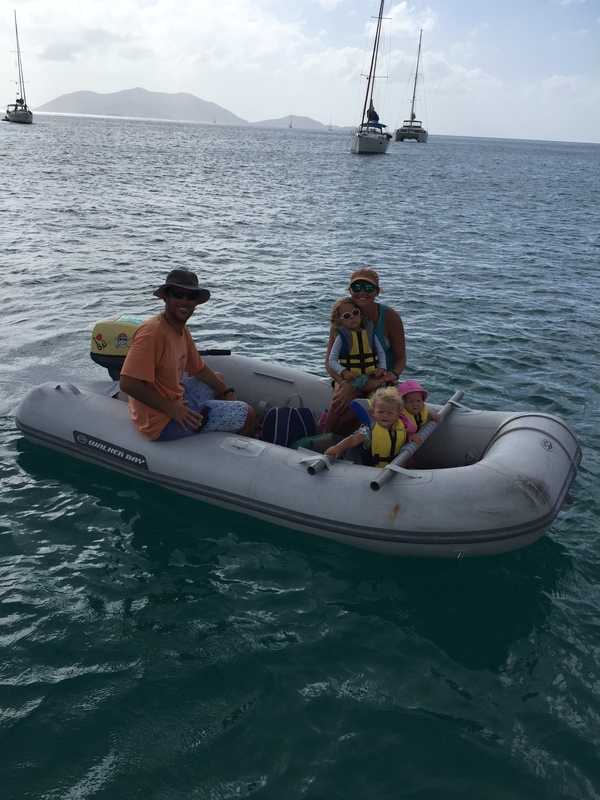 Sure, we had a blast snorkeling, relaxing and hiking at Maho and then again at anchorages in Leinster Bay and Salt Pond Bay. And sure the sailing is amazing and easy here with short distances between islands and waves that make you feel like you are on a Midwestern lake. But there was an underlying feeling of emptiness, as the echoes of past trips bounced around noisily in our ears. It was the perfect time for Serendipity to join our trip again, this time in the form of “Buddy Boating.” If you’ve read this blog for some time, you may remember me talking about Scott and Brittany Meyers. The Meyers set out a few years ago from Chicago on a sailboat and haven’t looked back. 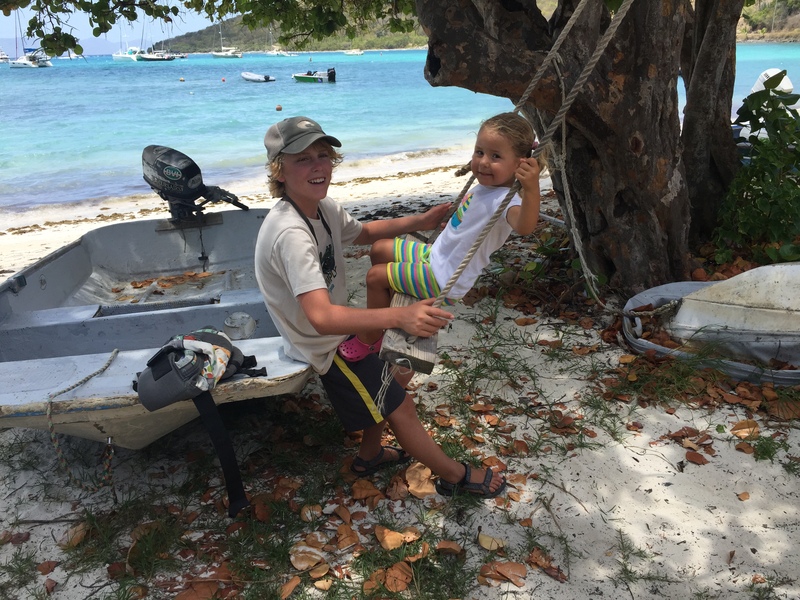 I’ve followed the adventure that is their life on Brittany’s blog Windtraveler since the beginning. 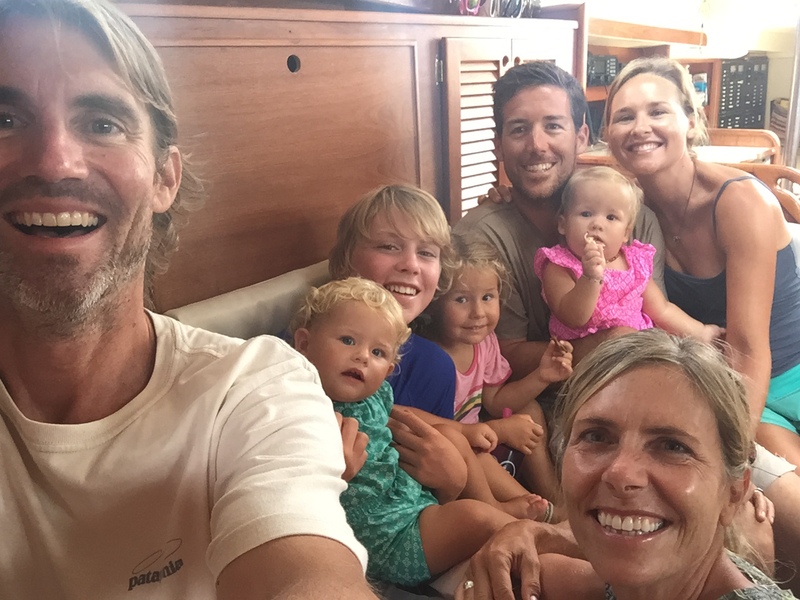 Three kids, two boats and thousands of sailing miles later—they are still going strong. We met Scott and Brittany in Chicago for dinner before our trip, searching for advice and maybe just a little bit of courage. A friendship was formed. 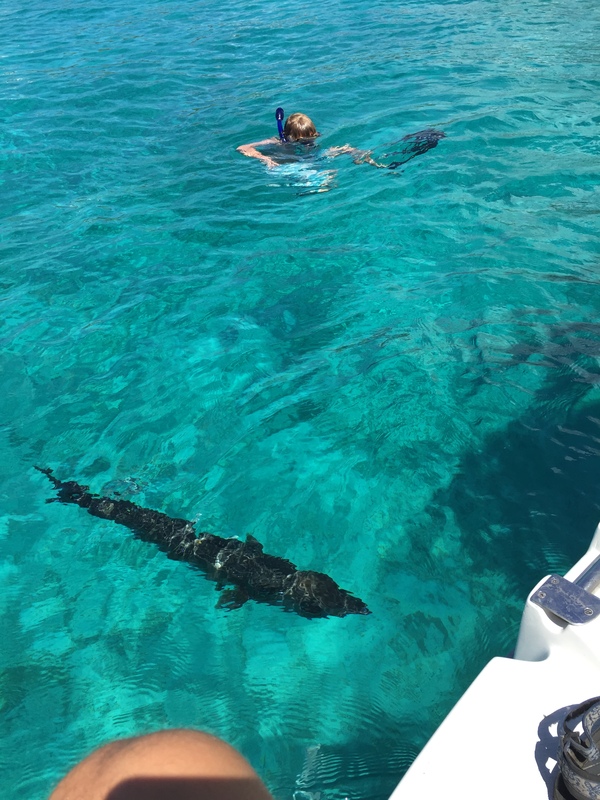 And now, serendipitously, we were getting the chance to see them again right here in the British Virgin Islands. Buddy boating is pretty much what you’d think. You learn that boat friends are in the area (usually this happens now via Facebook), you meet up, and you then bop around from island to island, from sundowner to sundowner, from dinner to dinner, from hike to hike, together. It’s pretty loose and informal most times, and man is it fun. 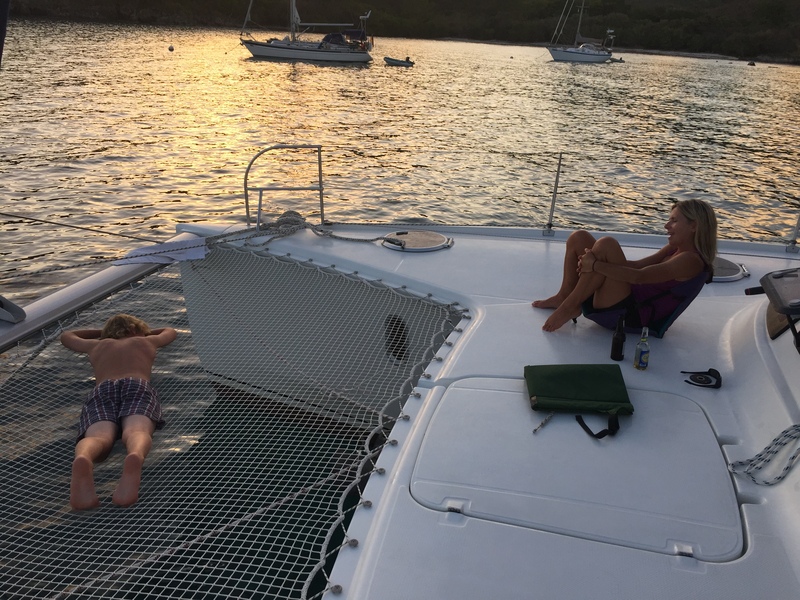 Sarah and I wanted to get a glimpse on this trip of what it might be like to actually live on our own sailboat, and buddy boating is a big reason why we now have more “pros” than “cons” on our live-aboard sailor ledger. Of course our favorable experience was due in large part to the awesomeness of our traveling companions. 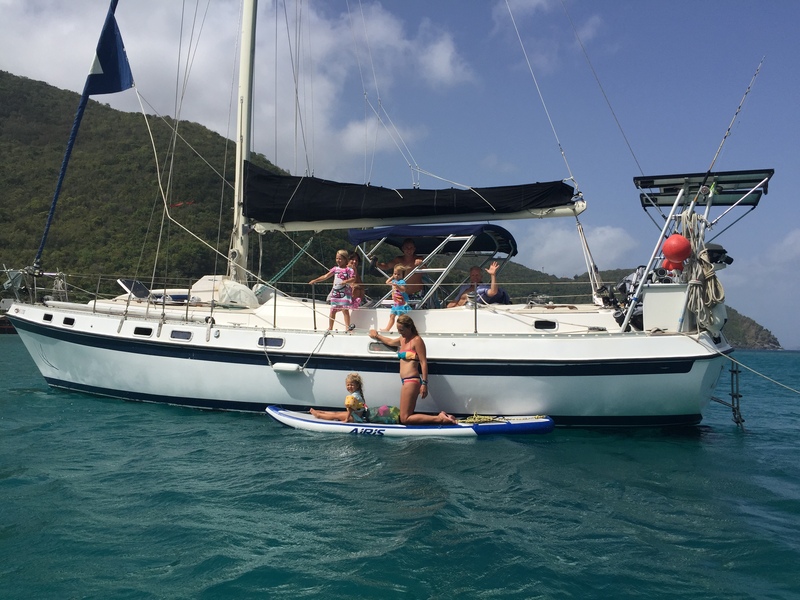 I’m not sure how Scott and Brittany pull it off, but they are raising three amazing girls on a 44 foot monohull sailboat. Oh, and did I mention that their oldest daughter just turned 3 and the two youngest are 13-month-old twins? Yep, their days are a constant sand-filled stream of crawling, feeding, napping, cleaning, crying, wiping, drooling, diapered, bucket laundry, sippy cup craziness. And they pull it off with a smile and an energy that is amazing. * Rock-Stars. 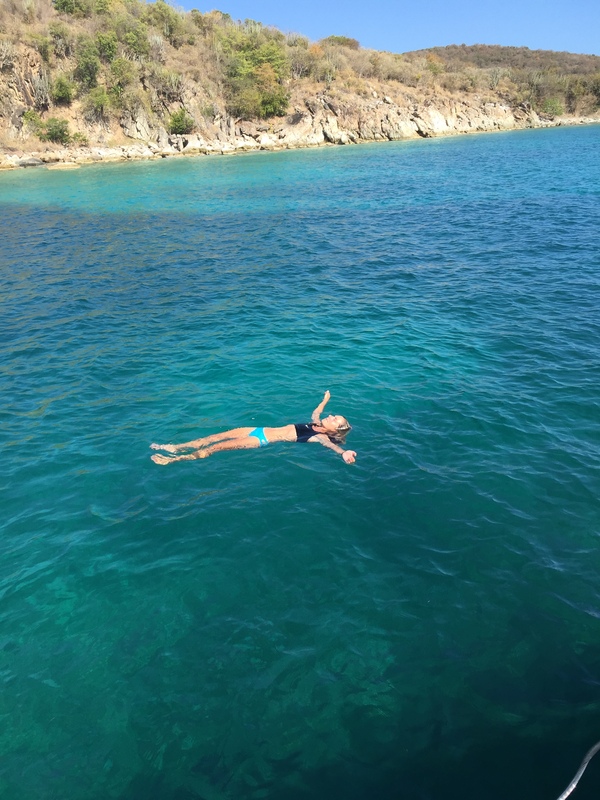 We spent time with our “buddies” on Jost Van Dyke, then moved with them to Cane Garden Bay, Tortola, to celebrate Brittany’s birthday, and finally sailed together around the north side of Tortola to Marina Cay. On our final morning together, Scott invited us over for waffles made with their new waffle iron. Scott was due in Road Town, Tortola that morning, but he rescheduled the meeting. As we lingered and talked long after the waffles were gone, it was pretty clear that we were all having trouble saying goodbye. In a few short days, a lasting friendship had been formed. The goodbyes were as hard as we expected, and we left with a strong feeling that this wouldn’t be the last time that we spent time with this amazing family. “I can’t wait to be a Dad someday,” Jimmy said to us after we untied our dingy from Asante that morning and made our way back to our own boat. I think that takeaway tells you the kind of people we had just started calling our good friends. And he wasn’t the only one that had gained a new perspective and some insights. Spending time Buddy Boating made me think about how many of us wait for some future milestone—a job title or a 401k balance—before we “sail away.” Instead, we put in our time doing something that we don’t really love in the hopes that someday we can [fill in the blank]. Is waiting wrong? That’s a personal choice obviously, that bleeds into questions about what it means to live a full and rich life that matters to you and the people around you. These are questions I have pondered often on this trip and the crews of Asante and Necesse provided me with a different perspective. A perspective that will certainly help me as we wind up our adventure and return to our “real” lives. Someday I’ll [fill in the blank]. It’s a question all of us should ask of ourselves. I hope you are able to design a life for yourself that makes it really hard to answer that question.